The C11 nave has a mostly C14 oblong, gabled tower on a base that is probably earlier. 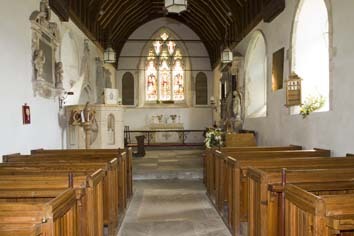 The chancel is C13 and C14. The monuments range from then to the C20. Westdean (so spelled to differentiate it from West Dean in West Sussex) is in a long valley running into the Downs from the Cuckmere valley. Today this is wooded, but this has only been so since the late 1920s. A C13 rectory by the church, which was tenanted by two labourers in 1850 (2 p13), was restored in c1891 to something like its original state. 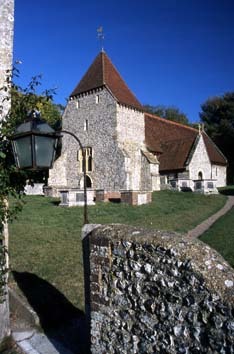 Unlike the C14 parsonage at Alfriston, it is flint-built with trefoiled windows. 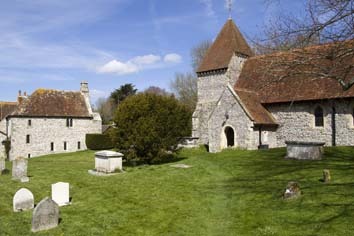 Westdean church is C11 in origin, as one north window in the aisleless nave, its head formed from one stone, shows. The west tower is as broad as the nave, but shorter from east to west, making it oblong in plan. The upper part is C14 (see below), but a horizontal divide in the south wall and the barely visible line of an earlier west gable suggest it was built on a C11 or C12 west extension, as is now thought to have happened at Sompting (West Sussex). Clarke and Leach prefer a C13 date for the lower structure (1 p106) though most such extensions earlier and that is more likely to be the case here. The flintwork is largely renewed, but the two-cell structure of nave and extension, which would probably have then lacked a tower, could be pre-Conquest. 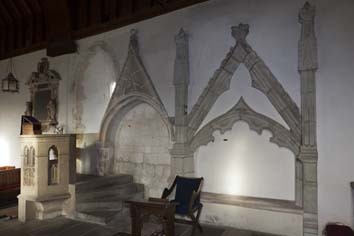 However, the relatively broad proportions argue against this and though the round-headed arch between tower and nave has been altered, the mouldings on its head are convincingly C12, suggesting that there was already a division between nave a west extension at this time, though there is too much plaster to be certain (Parsons and Milner-Gulland p129). Whether this first structure had a chancel is not known. The present one is as wide as the nave and the oldest feature visible is an early C13 north lancet with no scoinson. There is no chancel arch, so the roof is continuous. In the early C14, presumably when construction of the upper part of the tower was under way, the sides of the tower arch were altered with triple shaft responds on high square bases, all sharing a capital. Conical corbels support the innermost order of the unaltered head. 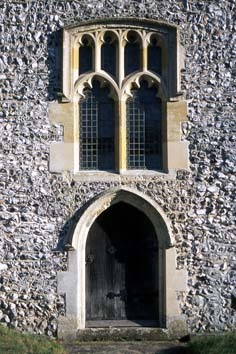 The C14 upper part of the tower is built of more carefully shaped flints and though the renewed segmental west window with panelled tracery and the moulded doorway look C15, the trefoiled opening above and pairs of smaller square-headed east and west ones are more consistent with the C14. The appearance of the spire, now tiled but previously shingled, is determined by the oblong plan, with truncated east and west gables. There is a diagonal buttress at the north west angle only, which might suggest that it was added in the C15 to strengthen the structure, since had it dated from the C14 and been part of the tower as planned from the start, there would probably have been a matching south west one. The remaining chancel windows are early C14. The three-light east one has cusped intersecting tracery and a moulded string-course under the interior sill. Though renewed, an engraving of 1850 (2 opp p16) shows it as unchanged. Of the two-light side-windows with trefoiled lights, that to the north is blocked. The C14 work was probably connected with two tombs (see below); one may commemorate Isabella Heringod, who died in c1329 (3). The nave was also altered, with a trefoil-headed north lancet (now blocked) and a broad trefoiled south window east of the porch. It is renewed and, in addition, the Sharpe Collection drawing (probably 1804) appears to show a pointed not a round-headed arch. Presumed C15 work is confined to the west doorway and window of the tower and also to a rood-stair at the north east corner of the nave. Its lower entrance is now hidden by the pulpit (Langdon p263); at least part of the screen lasted until the 1840s (2 p16). In 1850 the stonework of the church is said to have been ‘in perfect preservation’ (ibid p18) and, if so, it is surprising that it was so thoroughly replaced at H E Rumble”s restoration in 1878 (WSRO Ep II/27/123). Though his work usually repeated what had been there, Rumble was notoriously insensitive to old fabric and he also replaced the roof and most fittings. The reported cost of the restoration, some £1233 (KD 1899), seems on the low side, given the amount of work that was done. The two-light north nave window is C19 and it is not known if it had a predecessor. Bracket: (North chancel) Moulded and with a stylised flower incorporated into its base. It is placed between the C14 tombs and is probably connected with them. Font: C13 square bowl with a chamfered underside into which the capitals of the four supporting octagonal shafts are carved. It resembles that at Alfriston. 1. (East window) J Powell and Sons, designed by H Holiday, 1889. For unstated reasons, this was altered or replaced in 1890 (Hadley). 2. (South chancel, second window) J Powell and Sons, designed by —- Read, 1917 (Hadley list and CDG 286 p126). Inscription: (On lych gate) in memory of Evelyn James (no date) by E Gill 1931 (E R Gill p86). 1. 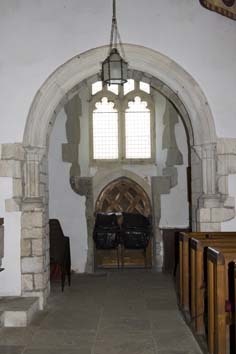 (North west chancel) Early C14 with a roll-moulded arch, a plain gable and finial. The lack of a tomb-chest is unlikely to be original. 2. (North east chancel) Possibly to Isabella Heringod (see above). This is a little later, with a coarsely cusped arch, heavy side-pinnacles and a crocketed gable. 3. (Nave north east) Susannah Tirrey (d1637) An early example of the cherubs and symbols of death that became popular in the later C17. 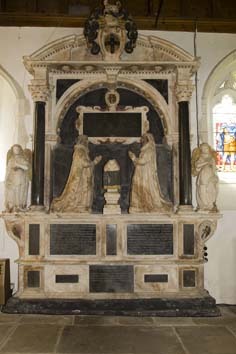 Since she was daughter of William Thomas (for his monument see immediately below), it is likely that both are by the same hand, suggested as T Stanton (BE(E) p657), though the quality of workmanship of this one seems lower. 4. (South chancel) William Thomas (d1639) and his wife (d1625). A large and ambitious monument, also attributed to T Stanton (BE(E) ibid). The figures are large and free-standing; the departed kneel within columns with two angels, beneath a rounded, broken pediment. Llewellyn (p379) suggests this may have been erected in the 1620s, though if the attribution to Stanton is sustained, this seems too early as he was only born c1610. 5. 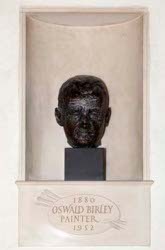 (South nave) Sir Oswald Birley, painter (d1952) Conventional head by C Sheridan (BE(E) ibid). 6. (North west nave) Lord Waverley (d1958) An altogether more vigorous bust by Sir J Epstein with a lengthy inscription, commemorating the former Sir John Anderson, Home Secretary in World War II, after whom the Anderson shelter was named. He is buried in the churchyard. 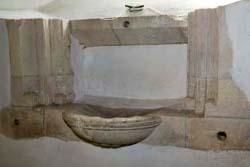 Piscina: (South chancel) C14, with a fluted bowl and moulded sides but no head. This seems to be missing because it is cut into by the rere-arch of one of the south windows, though curiously this is also C14. The present arrangement certainly predates the restoration since it is specifically mentioned by Hussey (p219). 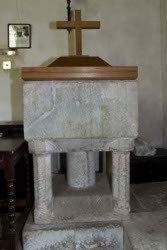 Pulpit: C19 and of stone, it is large and though heavy in appearance, lacks ornamentation. It seems too original to be by Rumble, but its authorship is unknown. Stoup: (by south doorway) C14 with an ogee head.